When our highly talented team of international designers and engineers first set out to create a completely new Riviera – one befitting membership of our exclusive SUV collection – they immediately turned to our loyal legion of blue-water cruising aficionados. After all, who better to help Australia’s most-awarded builder of luxury motor yachts refine its new model development than highly experienced members of our global family of Riviera yacht owners? Notably, the new 575 SUV is available with your choice of either conventional shaft drive or innovative pod propulsion to suit specific geographic and individual owner requirements – one of the first yachts in the world to offer owners such flexibility. Of course such world-leading thinking and creativity in design is evident right throughout this world-class Riviera, which has been built to last with global best-practice standards foremost in mind. For one thing, it’s 13.13m2 (141.3ft2) in size. You can imagine that when our talented team of designers set out to optimise this space they envisaged an entirely new indoor/outdoor experience – one that is ideal for longer range, live-aboard cruising. Under the cockpit floor you will discover volumes of storage and engineering access – to port there is a fish bin, with a massive centre lazarette with engineering access panels and a further engineering access hatch to starboard. Indeed, the entire yacht is virtually a magician’s trunk of storage solutions. Also here in the cockpit are wash-down facilities – both fresh and salt water – a double-action manual bilge pump for the engine room and both flood and courtesy lighting, while optional rod-holders and a padded bolster can be fitted to the cockpit coaming. There are recessed cleats in the aft corners so lines won’t snag, as well as toe kicks for bracing as you reel in your prized catch. The elevated mezzanine features an L-shaped lounge to port with fridge, freezer and storage space under, as well as a folding table with cover. Behind the seat across the rear of the bulkhead is access to the lockable battery control and AC panel and manual bilge pump. To starboard in the forward corner, is a double barbecue, fridge, ice-maker, rubbish bin and sink. The cockpit is complete with a covered joystick-control or thruster-control docking station to port, triangular quarter clears both port and starboard to keep any wind or spray out of the cockpit, and stainless steel grab rails leading safely forward. 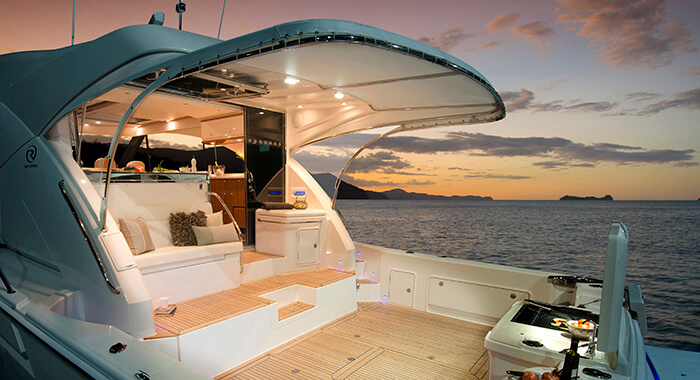 Wide walk-around side decks on the 575 SUV feature high quality 316 marine-grade highly polished stainless bow rails with mid safety wires, as well as port and starboard rails in the cockpit and above the saloon windows for your safety. The foredeck itself has options for a moisture-resistant closed-cell foam sun pad with stainless steel rails. There are both fresh and seawater wash-down facilities conveniently located at the anchor locker station as well as rope and chain divider, and winch with hand-held remote. The 100m (328ft) of chain is 10mm (3/8”) in thickness and galvanized, and there’s a chain-stopper fitted to the deck. The self-loading bow roller and 45kg (100lbs) anchor are, of course, stainless, as is the chain chafe plate that helps protect your investment. As you slide open the glass saloon door, set in a substantial, polished, marine-grade stainless steel frame, you get the sense you are stepping into a high-end modern apartment – a creative space designed to deliver all the delights of a lavish and contemporary city lifestyle. Immediately to port there’s the aft galley – a generous and efficient two-person U-space just off to one side of any fore and aft traffic. Here, cockpit connectivity is cultivated with a wide opening glass window that brings the outdoors (and entertainment) inside, and confirms the galley as very much the ‘conductor’s podium’ of the social scene. 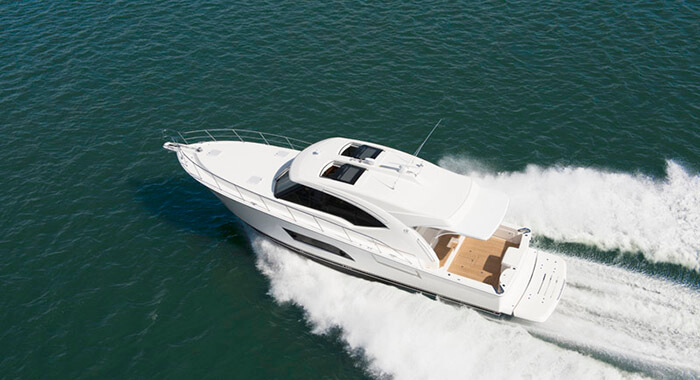 The 575’s galley itself is akin to a display kitchen for the latest in premium-brand appliances and conveniences, complemented by satin oak timber cabinetry with teak accents above the solid-surface bench tops. Its warm heart is a stainless steel cooking array that includes a combination oven/microwave, electric three-element induction cooktop and range hood. The refrigeration suite features both fridge and freezer drawers. And the well-placed dishwasher, within easy reach of the stainless steel sink and mixer tap, is also a back-friendly, easy-opening style. Directly opposite to starboard, almost as an extension to the galley, are further fridge and freezer drawers that operate smoothly, as does all the cabinetry that opens and shuts on the 575, on soft-close runners. But, then, everything on the Riviera 575 SUV is intended to run smoothly. And you’ll be forgiven for not noticing the spacious storage underneath the lounge, but then this is all part of the clever, unobtrusive way the 575 melds form with function. From the saloon seating arrangements, (as well as from the cockpit) you also have a clear view not only of the almost 360-degree water-view vista, but the massive, wide-screen 48” LED TV that rises electronically from the forward dash, creating a floating sports arena or movie theatre experience that is enhanced by the Yamaha AV receiver with two zones and party function and the subwoofer-enriched, 5-speaker Bose highfidelity audio system, with Apple TV and WiFi router. Or if you prefer to relax in air-conditioned comfort, that is also a standard throughout all living areas of the new and luxurious 575 SUV. The master’s king-size island bed with innerspring mattress and upholstered headboard detailing is set in the gentle ‘sweet spot’ right amidships, with real dancing room either side; even allowing storage cabinetry along both perimeters. 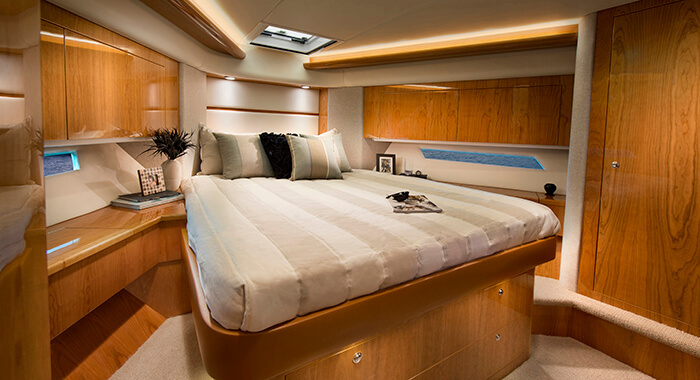 The master also has long hull windows each side with optional opening porthole, as well as but its own sofa, 32” LED TV integrated into a home theatre system, full walk-in cedar-lined wardrobe (with full mirror and shoe racks). The forward guest stateroom (or VIP suite, if they’re very favoured friends) mirrors the level of luxury in the master. Positioning a queen-size walk-around bed with innerspring mattress in pride of place, again with good side access, plenty of fragrant, cedar-lined, gown-length hanging space, bedside tables with timber tops and also its own ensuite bathroom which, with two-way entry, also serves as the day head. Natural light filters into the VIP stateroom courtesy of fixed hull windows with tinted, tempered glass with blinds for privacy, while fresh air is delivered through two hatches, which can also be screened for privacy, as well as reading and overhead lighting. The impressive ergonomic helm of the 575 SUV features two fully adjustable chairs – one for the skipper and one for their companion – each with arm and foot rests and from which all essential navigational and systems controls are within easy reach of the skipper. There’s also an option for two additional helm seats on the starboard side should owners prefer. Here you will also find convenient drink-holders, a side console to port and a moulded recess forward for keys and mobile phones (with USB charging port), ensuring everything is right where it should be when you need it. The IPS pod propulsion system already offers the amazing joystick manoeuvrability, Dynamic Positioning System for station-holding while preparing lines and fenders or while waiting off a fuel jetty, as well Anti- Corrosion Protection and Auto-Pilot, and optional auto-trimming features. In the case of IPS, it also extends to auto-trim and full slow-speed steering, as well as the outstanding manoeuvrability of SportFish mode, and the clean presentation of bait using the bypass exhaust features of the Clear Wake feature. You will also find fresh water tap and hose feeding off a 750-litre (198 US gal) freshwater tank which has a 230V (110V) AC pump powered from the inverter, as well as a back-up freshwater pump (24VDC). The Riviera 575 SUV has dual Racor fuel filters as standard and a massive fuel capacity of 4000 litres (1057 gallons), including a long-range tank forward under the master bed that can be easily transferred to the two wing day tanks via two pumps, and which are balanced to a further day tank. The fuel gauge is connected to and monitored at the helm via the Glass Cockpit, and there’s also a sight gauge on each wing tank for added peace of mind. The air-conditioning, cooking appliances and all the comforts of home are powered through the Onan 17.5kW (75 Amp 50HZ) generator, which features a water separating muffler, sound shield, remote stopstart function, diagnostics and hour meter. 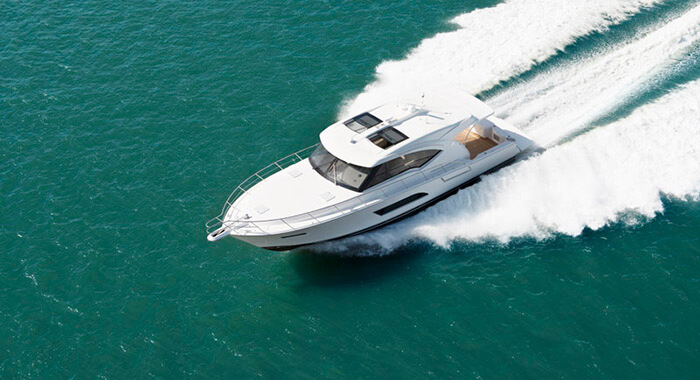 The 575 SUV’s confident poise is just as evident offshore as it is at anchor – her solid and robust hull with keel is the evolution of Riviera’s rich 35-year heritage in building world-class luxury motor yachts that are proven in the tough Australian blue-water conditions. Riviera’s lamination technology also helps to precisely replicate the exact lines lofted from our design software, and this accuracy is flawlessly reflected in the deep gloss of the final isophthalic gelcoat exterior. Even before a single piece of timber was cut for the plug work, the 575 SUV was created in-house using industry-leading Unigraphics 3D computer software, allowing Riviera’s team of talented and passionate international designers and engineers to put to purpose all available space, with a firm focus on convenient access to every key maintenance point so any issues can be quickly identified and addressed, and service costs are kept to a minimum.